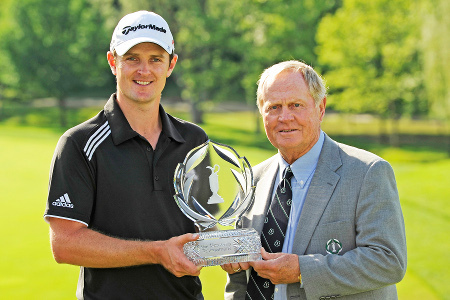 Justin Rose, 2012 winner of the Memorial Tournament, with Jack Nicklaus. Rose joins PGA TOUR Rookie of the year Jordan Spieth and 2004 winner Ernie Els in committing to the Tournament. Dublin, Ohio — Officials of the Memorial Tournament presented by Nationwide Insurance announced today that the Tournament has accepted the commitment of Jordan Spieth, one of the best young players in professional golf and the reigning PGA TOUR Rookie of the Year. Spieth burst onto the PGA TOUR in 2013 and recorded one of the top rookie performances in TOUR history, culminating with a selection to the U.S. Presidents Cup Team. The 20-year-old Texas native recorded nine top-10 finishes last season, including his first-career PGA TOUR victory at the John Deere Classic. Spieth made 18 of 23 cuts and finishing 2013 ranked 7th in FedExCup points. He has continued his inspired play this season posting six top-10s over 14 starts, including two runner-up outings at the Hyundai Tournament of Champions and The Masters Tournament. Spieth currently sits a career-high No. 8 in the Official World Golf Ranking and No. 6 in FedExCup standings, to go with career earnings of $7,051,243. He debuted in last year’s Memorial Tournament finishing T63 after rounds of 72-73-82-68 for a 73.75 scoring average and earnings of $13, 206. Rose, 33, is the reigning U.S. Open champion and 2010 winner of the Memorial Tournament. He will be making his 10th start at this year’s Memorial where he is ranked 5th on both the Tournament’s career money list with $2,198,620, and in scoring average with 71.16. Rose finished the 2013 Memorial in a five-way tie for eighth place, his fifth top-10 finish at Muirfield Village Golf Club. A resident of London, England, Rose has recorded five career PGA TOUR victories and career earnings of $26,973,944. He has posted five top-10 finishes in the 2013-2014 season and is ranked 36th in FedExCup points and No. 9 in the Official World Golf Ranking. Memorial Tournament veteran and 2004 winner, Els will be teeing it up for the 21st time at the 2014 installment of the prestigious invitational Tournament hosted by golfing legend Jack Nicklaus. Els has career earnings at the Memorial totaling $2,001,604.81, placing him 6th in Tournament history, and a 71.33 scoring average. His T37 finish in 2013 marked his 18th made cut at Muirfield Village Golf Club, with six top-10 finishes to his credit. The 44-year-old South African is currently ranked No. 96 in FedExCup Points and No. 48 in the world. Els has been a member of seven international Presidents Cup Teams and has career PGA TOUR earnings of $46,746,464 to go with 19 TOUR victories. In other Tournament news, badges for the Golden Bear Club have officially sold out. Fans that purchased the new upgraded badge will have access to a menu of items for purchase catered by Cameron Mitchell Premier Events, a cash bar, television viewing, private restrooms, scoring terminals and open seating in a sports bar atmosphere. The Golden Bear Club is located within the new Patron Village in the heart of Tournament play, between Hole No. 10 fairway and No. 14 green. Patron Village includes an area that is open to the public, featuring upgraded food and beverage options, special merchandise, a large video screen, a patio and more. All-week Patron Badges to the 2014 Memorial Tournament presented by Nationwide Insurance remain available to the general public. The badges, valid May 26–June 1, cost $165 and include three complimentary any-day Practice Round tickets at no extra cost. Badges ordered through tomorrow, May 16, will be shipped. Orders placed after tomorrow can be picked up at Memorial Patron Will-Call beginning May 26. As always, kids 12 and under can attend for free, and kids 18 and under are admitted free on Wednesday for Junior Golf Day with a ticketed adult. The public may call the Tournament Ticket Office 9 a.m.–5 p.m. weekdays at 877-MT BADGE or visit www.mtbadge.com to purchase badges. Daily tickets for Monday, Tuesday and Wednesday practice rounds are also available. The cost is $35, and they are valid for all three practice-round days.